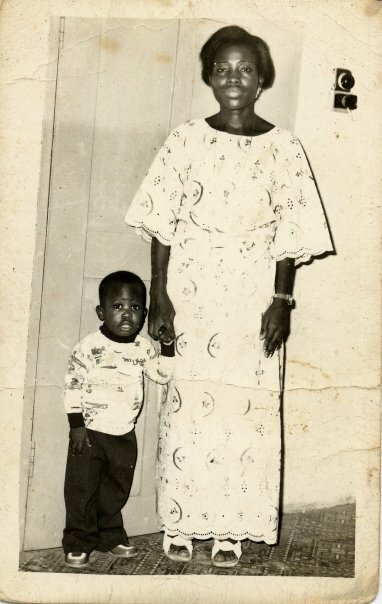 My mum, Oyindamola, my first teacher, my first confidant, my first guide, my first priest. To the world, you might have been one person but to me you were the world. Mummy, you did not build houses, factories or palaces but you built ME and my siblings – Ronke, Doyin, Tokunbo and Bola. Mummy, you did not leave millions behind in your bank account but you left behind enduring legacies worth much more than millions. Who could dispute that you were a virtuous wife and mother? Who does not know of your famed patience and enduring spirit? You were a godly mother. You not only taught me the way of the Lord, you also led me in the way by your examples. You taught me to love the Lord, pray, study the Bible, and be committed to fellowship. What more could I have asked for? You and dad were never slack in constantly praising me publicly. 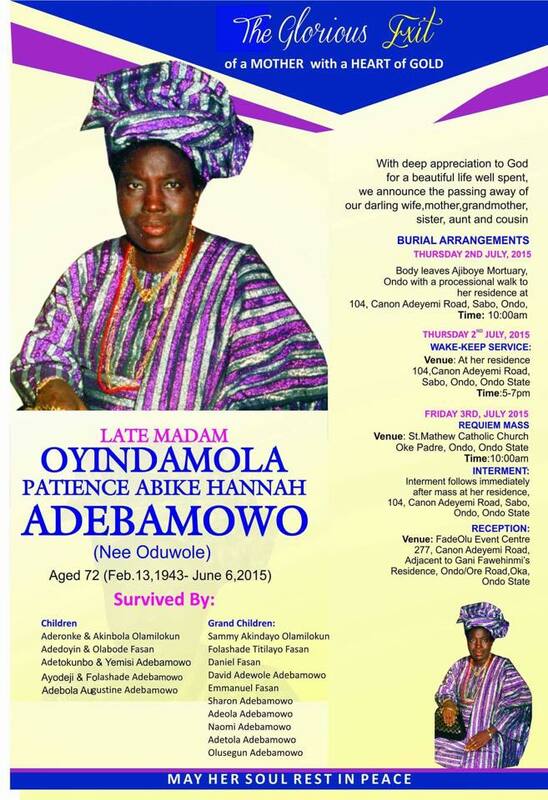 You were forever teaching us through your numerous proverbs in English and Yoruba languages. In my childhood you rammed into my little head that “A stich in time saves nine”. You often said, “As you lay your bed, so you lie on it”. I learnt from you “To make hay while the sun shines”. 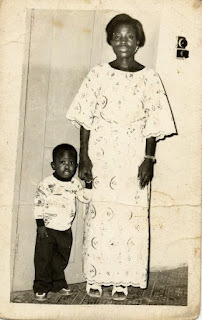 Mum, you helped nurtured my potentials immensely. Early in life, you helped develop in me a love for reading and passion for academic excellence. At the start of my primary education at St Mary Catholic School, Ondo, when you saw how poorly I was performing academically, you knew it was because I was just too playful. You therefore did the seemingly unthinkable! You walked to my classroom unannounced one day and with my teacher’s permission, stood in front of the entire class and told all my classmates to reduce their playful interactions with me because I wasn’t serious enough. And that action you took worked. Within a term, I moved from my perennial 36th position in class to 3rd position and then to 1st position the following year, a position I maintained throughout the rest of my primary education. With your support I skipped primary 6 having passed the common entrance exam to Ondo State Unity Sec. School Ikere-Ekiti at the age of 10. Throughout my secondary education and subsequent university education at Obafemi Awolowo University, Ile-Ife you were a pillar to me. You supported me in every way you could. After my graduation, concerned about the delay I had in finding a job, I recall how one day while you were effecting a transaction at the bank, you were compelled to mention to the bank clerk attending to you that you had a graduate son looking for job! The clerk advised you to tell me to bring my CV to the bank manager straight away. Although I didn’t get the bank job but that action you took was typical of your willingness to secure a better future for me and my siblings. Even though I had to leave you and dad 11 years ago as a young man in search of the proverbial greener pasture, coincidentally in the same United Kingdom where you both had begun your own family life, mummy you were literally on my mind day and night. As much as I could, I endeavoured to travel down to Nigeria almost every year to visit you and check on your well-being. Your health, happiness and well-being were uppermost in my heart all the time. Although you were out of sight most of the year, not for once were you out of my mind. As my level of income increased, I ensured it reflected accordingly in the provision I made for your welfare. As recent as mid last year, even when you did not complain of any new health issue, from my base abroad I still arranged for you to be taken to Ondo Specialist Hospital by our dear aunty Victoria Oloro and your carer – Iya Eji. It was meant to enable you undergo general medical check-up, an intervention which did not pick any new health challenge at the time. Until that fateful Saturday afternoon on June 6, 2015 when you could fight no more and had to succumb to the cold hands of death. You died just a week after I had left you to return to UK. 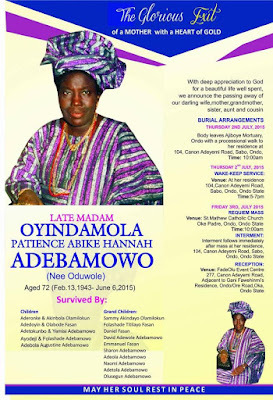 Mummy, I will forever cherish those last moments my wife, children and I spent with you in May 2015. Yes, mummy, those last moments when on every single night after everyone had gone to bed, I would come back to your room to pray affectionately for you. I would thereafter sit down for prolonged period sometimes till midnight and beyond simply watching over you with deep affection as you sleep sweetly in your special water-bed. In those moments, I saw an aura of indescribable peace and happiness around your person. But while I have been mourning your departure with uncontrollable tears, I am much more comforted by the good news that you are now resting with your Lord and Saviour, Jesus Christ the King whose vicarious death has secured eternal life for all who believe in Him. For the umpteenth time, I wonder to myself again, “So it is true!” With sorrow in my heart but gratitude to God for a life well spent, I say adieu mummy. Goodnight mummy. O daaro mummy. Au revoir mummy. Bye mummy. I loved you till death mummy and heaven knows I did and still do and will forever do. Your son and fourth child, Ayodeji Ambrose Adetula n se daro re. O digba.